Update: The snake is fake! 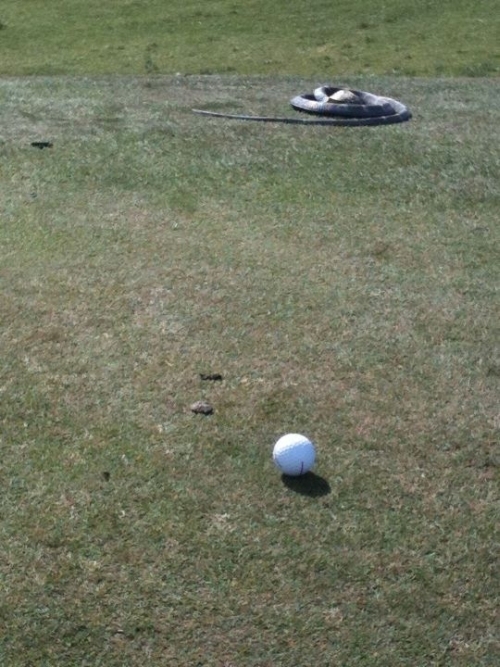 It turns out this snake is fake and is being used by Huntingdale to keep ducks off the greens. Hope that doesn’t apply to all birdies. Update: I’ve been reminded that Decision 1-4/10 covers a situation like this which allows the player to take relief, without penalty not nearer the hole and as than the nearest spot not nearer the hole that is not dangerous. As if there isn’t enough hazards on most golf courses. Just another thing you need to be aware of while playing golf in Australia during the warmer months. I have almost stepped on one while playing a round. The worst we have to deal with in New England might be snow in the spring time or the occasional moose. Yikes!! The snake is a fake. It’s being used as a trial to keep birds off the green. Is that right!? no wonder my source didn’t want to say anything more about it!